Kalani Queypo stars as Parahunt, Pocahontas' brother, in "The New World," an adventure about the founding of the Jamestown Settlement in 1607. For someone who grew up mostly fatherless, sharing a cramped one-bedroom apartment with three siblings, actor Kalani Queypo is doing just fine. "Sometimes I find myself working on a set or in a strange location and think, 'Wow, I'm just a local boy who grew up running around barefoot in Waikiki, cutting class to catch some waves,'" he says with a laugh. Queypo's latest movie role is in Terrence Malick's "The New World," as Pocahontas' brother Parahunt. Portraying an Algonquin Indian in Colonial America in a big-budget, big-star, big-director movie is no small feat, but pulling off such challenges is what Queypo has made his trademark. Decisions that would take some people a lifetime of second-guessing are second nature. After graduating from McKinley High School, Queypo began his journey in the apocryphal way: with a few hundred dollars in his pocket and a one-way ticket to New York City. "I think that growing up in Hawaii and then moving away to a totally different kind of environment has helped me to gain perspective and discover who I really am," he says. Funny to hear it said, but it's true; sometimes what you think you are leaving behind becomes your greatest asset. For Queypo it was his native Hawaiian and Blackfoot Indian heritage. His name, pronounced KWAY-po, is Spanish, from his father's stepfather. "I grew up singing and dancing," Queypo says. "We'd studied and danced traditional Hawaiian dance until I was 9, which is when my father died." Although his father's fatal asthma attack left his family in poverty, Queypo's pride -- and resourcefulness -- kept him going. "I had to become this beach bum character to convince other kids that my old T-shirt and gnarly slippers were my personal choice of style," he says. "I had to figure out ways to make things happen for me, figure out how I was going to get clothes for school, money for books and school supplies." Both his perseverance and rich cultural upbringing came in handy at auditions. "When I was in New York, because I sang, I would end up at these auditions, and because I was a specific type, I would get chances to get in doors to bigger projects." But Queypo learned quickly that getting in the door was easy; staying to celebrate was another matter. "I found myself at call-backs and they wanted me to dance, and I couldn't dance! I'd never had jazz or ballet training," he says, shaking his head. "I went straight from a call-back that was a bumbling, humiliating nightmare to a dance store, and I was like, 'I wanna take a dance class!'" Queypo takes pride in playing ethnic roles. Queypo plunged into dance study, soon earning a scholarship and taking up to 11 classes a week -- in between shifts at two jobs and his auditions. As he paid his dues and began to get more and more roles in plays, Queypo met other American Indian actors and writers, including Raoul Trujillo, who plays interpreter Tomocomo in "The New World" and was the movie's main choreographer. 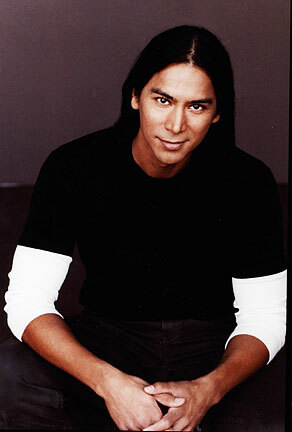 By the time he auditioned for the part of Parahunt, Queypo had moved to Los Angeles and solidified his reputation as an actor and dancer in the close-knit American Indian performing arts community. His recent roles have included last year's miniseries "Into the West" and the 2001 film "The Royal Tenenbaums," in which he played a New Guinea tribesman. Jean Bruce Scott, executive director and writer for Native Voices at the Autry, a Los Angeles-based arts program devoted to plays by American Indians, says Queypo possesses qualities that go beyond his extensive training. "A successful actor also needs to have 'it' -- that certain spark and innate ability to transform themselves right before our eyes and draw us into the heart of the character they are playing." By choosing to draw on his heritage, Queypo knows he risks being typecast. But what some might see as a risk, he sees as opportunity. "I used to think that being ethnic was a disadvantage in this industry, but now I see it as my strength," he explains. "No matter how hard I tried, I was always viewed as 'ethnic,' and what I started to do, instead of wishing I was something else, was begin marketing myself as a modern actor who was ethnic. That was when the doors started opening up for me. "I no longer fear being typecast; in fact, I want producers and directors to think of me when they are casting the next native film or Polynesian epic. I think we are all still waiting for that big epic on King Kamehameha!" Scott says typecasting is a risk for actors unless they "reinvent themselves" with each role. "Our best actors continue to do this, and keep getting better and better, and keep getting cast in new and different roles. "Often, actors think, 'Well, I won't go in and audition because they already know my work,' or 'They already have someone else in mind,'" Scott explains. "But the really successful actor says, 'I've got more to show them,' and he takes risks and wins the role." Queypo did this when he auditioned for the Native Voices production of "Please Do Not Touch the Indians," Scott says. "He had a unique take on the character and won the role away from another actor who we thought was going to play the part!" "The New World" has been an incredible experience for me because it's been a huge, huge, huge opportunity," Queypo says. "And my experience working with Terrence Malick was crazy." So crazy, in fact, that the reclusive director, who has directed such artistic works as "The Thin Red Line" and "Badlands," paid him one of the highest compliments of his career. "There was one particular day when we were shooting a play scene, just the two of us, in a big field with tall foliage," Queypo says. He and Q'orianka Kilcher, who plays Pocahontas, were chasing each other, "singing, wrestling, simply having fun together." When the film ran out on the take, Queypo says, "Malick walked over and proclaimed, 'That was the most beautiful thing I have ever shot, it was so simple and human.'"